Sodium nitrate is the chemical compound with the formula NaNO3. Sodium nitrate is a white solid very soluble in water. 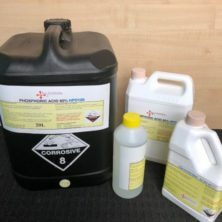 It is a readily available source of the nitrate anion (NO3−), which is useful in several reactions carried out on industrial scales for the production of fertilizers, pyrotechnics and smoke bombs, glass and pottery enamels, food preservatives (esp. meats), and solid rocket propellant. It has been mined extensively for these purposes. Sodium nitrate is also a food additive used as a preservative and colour fixative in cured meats and poultry. Less common applications include as an oxidizer in fireworks, replacing potassium nitrate commonly found in black powder, and as a component in instant cold packs.